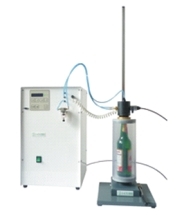 This Carbonation System has been designed for carbonation of beverages in glass and plastic bottles. The device carbonates individual beverage samples with exactly predefined CO2 content. The possibility of different carbonation settings helps to develop optimally carbonated beverage samples for sense analysis. The Carbonator is an online-carbonation system for accurate and continuous carbonation of beverages. The full automatic system measures and controls the content of CO2. It works without losses and is fully CIP capable. Due to its compact and modular design, it can be easily integrated into any existing plant system. The most important part of the Centec Carbonation system is the injector nozzle which is customised for each individual system. Its integrated Vortex edge enables CO2 to be added effectively to the beverage and evenly dissolved in it with only a minimum pressure loss and without static mixers. The Modular Concentration Monitor (MCM) controls the system. It measures and continuously monitors the CO2 concentration with an In-Line CO2 sensor; adjusting inflow of the required CO2 amount with a pneumatic control valve. If required, the system can also be supplied with a booster pump, pressure holding valve, and sterilisation filter. An optional remote access service kit allows software updating and trouble shooting within a few hours.